Whether you’re out for a quick errand or partaking in a full day excursion with your child, The Dad On Diaper Duty Pack will help you easily tackle the day. You're a straightforward guy with simple tastes -- you don't need complex patterns or dozens of colors for the bag you use to carry around your kid's stuff. You need a diaper bag backpack that matches your personality and comfort levels. The D.O.D.D. XH pack in Khaki is the perfect solution! Not only does it spare you from dragging around a pastel shoulder bag, the shoulder straps and built-in waist belt are adjustable and distribute the weight evenly for a comfortable fit. Made with heavy duty 600 Denier polyester and fitted with insulated bottle holders, a diaper pad, and pockets to hold everything from a compass to a pacifier, you're ready to hit the trail with your tykes. Or run to the store for the weekly grocery trip, whichever. 18" x 10" x 7", 1,260-cu. in. capacity., 2 lbs., 6 ozs. Please Note: USPS Priority Mail is the regular shipping service from USPS. It is NOT Express Mail Service. 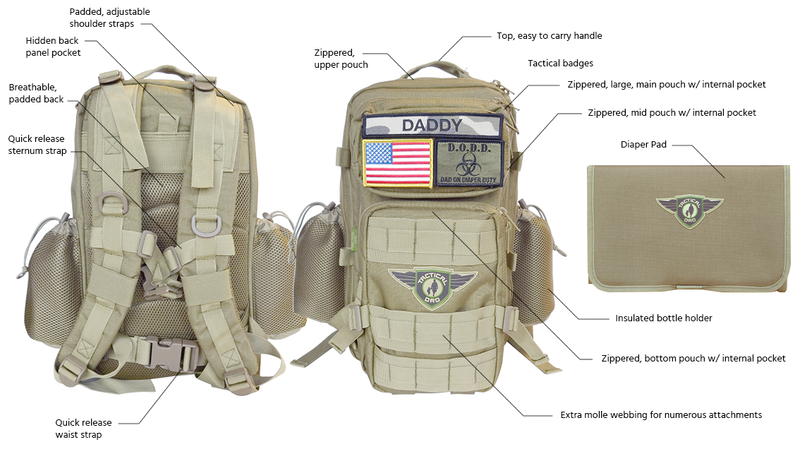 Your Tactical Dad Pack is ready to follow you and your family anywhere. with your family and Tactical Dad Pack by your side, you can do just about anything.